Enter the MICRA into the Ultra Family of Nurse Call. Intercall Systems, Inc., a leading manufacturer of Nurse Call and Healthcare Facilities communications systems, is announcing its latest product the MICRA MASTER STATION which is undergoing final testing and programming review and anticipated for Hospitals and other Healthcare Facilities installations very soon. The benefit of the MICRA Master is its small size. It’s approximately 1/3rd the footprint of the other masters within the Ultra Family. This smaller size saves on counter space and can be wall mounted. 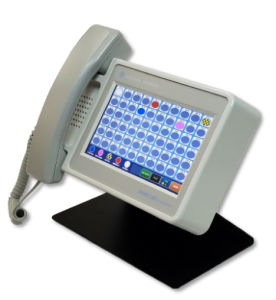 The compact unit features a 7” bright touchscreen display, integrated audio, 60 position Direct Call screen, 5 User menu buttons with multiple levels, Patient Status, etc. and incorporates Ethernet and USB ports. The station features a minimum of 12 programmable levels of calls including: Normal, Priority, Staff Assist, Cordout, Code Blue and more. 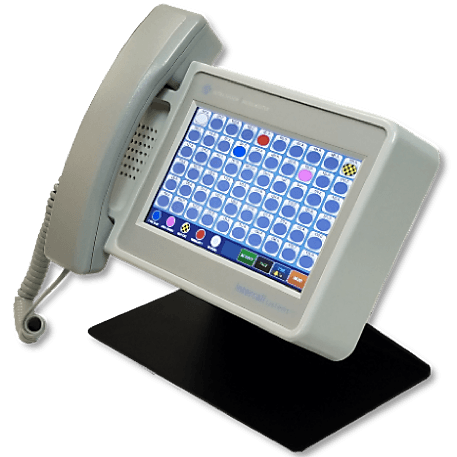 The Ultra System is the premium Intercall Systems Nurse Call product that has many years of evolution and updates built into the system based on the growing needs of Hospitals and nursing staff. We have taken many years of experience of the full-featured Phoenix Touch Screen and have created a new station that has all the features needed, at half the size and less than half the price of our premium system. In addition to serving as the Master Control Station, the MICRA can easily replace the Ultra Mini-Master Control stations and provide more features. The MICRA master is equipped with many of the features as the Phoenix master, but comes standard with the ones that nearly all hospitals use, at a significant savings in space and cost. We want our clients to pay for the features and benefits that they need and will use, not extras that are not utilized.